Why am I just now hearing about this? PeaceHealth is only required to notify addresses within 500 feet of their boundary. Existing Plan directs majority of new growth towards the unpopulated N/NE. Proposed change directs new growth to most Southern edge of property, closest to existing residents and businesses. Included in the proposal, situated atop a new 6 story building (tallest on campus), is a 2nd additional helipad. This particular change, located higher and closer to the neighborhoods, would instantly double the number of approaches/landings/take-offs, with associated noise, safety and quality-of-life impacts. Any growth in flight numbers would result in compounding impacts (rooftop helipad would serve as a ‘lily pad’, with patient drop-offs to the roof, then taking off and landing on nearby ground helipad). How will that impact our neighborhoods? Noise pollution: Increased helicopter traffic, altered flight paths, and activity associated with round-the-clock operations located at Southern edge. Safety: Helicopters are fascinating mechanical inventions that can have life-saving impacts. They are also mechanical devices operated by humans that have the potential to fail, as evidenced in tragically fatal Puget Sound news events (Seattle news stations, Airlift Northwest, etc). Doubling the activity increases the chance for failure at their most vulnerable situations (take off and landing). Locating an additional helipad on the rooftop and closer to vulnerable populations amplifies that potential risk even more (hospital patients and staff, nearby senior living/ nursing home citizens, associated businesses, residences, Parkview Elementary children and staff). Traffic: Increased building footprint will bring additional customers and staffing. Virtually none of the existing plans to deal with traffic have been implemented (internal traffic circulation plan, etc). Concerns from surrounding neighbors have resulted in no action or changes. The proposed plan includes no action-ready solutions to deal with increased traffic from the proposal, let alone the existing levels that continue to increase. Time is of the essence. PeaceHealth hopes to have their proposal finalized and submitted for approval process by end of summer. What is the CPNA’s stance? How can I get involved and offer input? Using Contact list below, phone/email the City Council and Mayor’s office. Write letters to the editors of our local news outlets. Let the Bellingham School District know that you are concerned about the impacts. Ask PeaceHealth to abandon its plan for a second helipad and focus new construction toward the unpopulated North, as has been the agreement for 20+ years. How can I find up-to-date information? Regularly check CornwallPark.org website, reach out to CPNA Area reps.
Where can I find the current exiting Institutional Master Plan? Where can I find PeaceHealth’s proposal of changes? As neighbors and members of the community, we are excited to hear that PeaceHealth continues to look for ways to improve services and patient care at their location here in Bellingham, WA. 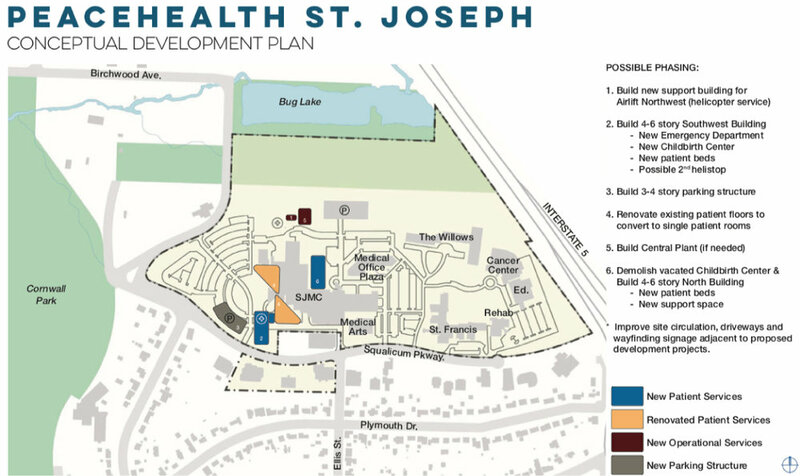 As neighbors, we have worked closely with St Joseph Hospital on Master planning that benefited the hospital, the neighborhood, and the community as a whole. Those past collaborative efforts resulted in a plan that reduced negative impacts on the neighbors and surrounding communities while providing for future growth for the institution. The plan to focus new development towards the unoccupied Green Space along Bug Lake and I-5 represented a perfect fit to meet the operational needs and continued growth of the institution, while preserving the relationship with its neighbors. Though the collaboration in the past was successful in many ways, there are many aspects of the previous plan and agreements that were never met on the behalf of PeaceHealth St Joseph. Decades passed while commitments the neighbors were assured would be met went unaddressed by PeaceHealth. As neighbors, we continued to give the hospital the benefit of the doubt and understood that among the many priorities faced by a Medical Institution of your size, sidewalks, traffic control, and flight path were not listed as a top priority. PeaceHealth's failure to meet their commitments has unfortunately resulted in a lack of trust, and in many ways a difficult relationship between the institution and the surrounding neighborhoods. To many of us, it came as a great surprise when we were notified that PeaceHealth was beginning the process to rewrite their Institutional Master Plan while so many commitments were left unmet. When we were informed that PeaceHealth no longer planned to honor the agreement to focus new development towards the unoccupied Green Space and I-5, but instead encroach on the neighborhood, we were shocked. With one of the goals even stated on your own website being to create a plan that "identifies & reduces the impacts of institutional development on surrounding areas", it's hard to understand how your institution would even consider siting a 6-story building with an additional noisy, high-risk helicopter landing pad on its roof, 300 feet from its nearest residential neighbor and a little more than a thousand feet from a Elementary School filled with children. The fact that a community hospital would even consider posing such a safety risk and disruptive plan to our community is immensely disappointing. We're hopeful that PeaceHealth will reconsider their proposal and work with its neighbors to find an alternative solution and compromise which meets the needs of the institution and its neighbors.